Make certain the windlass is on if you have one. Make sure the bitter end is secured to the boat. Enter the anchorage slowly and connect what you saw on the chart to what you see in real life. 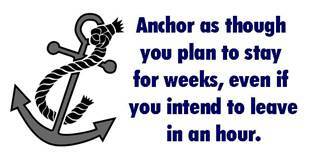 Observe how others have anchored – one anchor or two? Scope? Do not just drop everything in a heap. Pay it out slowly as the boat drifts back so the rode stretches out cleanly from the anchor. At about 3:1 scope, set the anchor with a gentle tug. Let out rode at 5:1 minimum scope, 7:1 for comfort, 10:1 for storm conditions, taking tide into account. Let the anchor settle into the bottom and observe against at least 2 objects on shore for any movement. If the anchor drags, pull it up and try again. Carefully lay a hand or foot on the rode to feel if it is dragging. 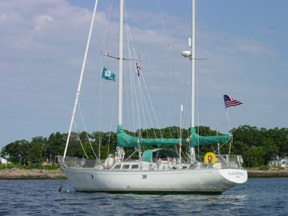 Once the anchor has set, power gently in reverse to power set. Observe where there are other boats, ways to exit the anchorage, and alternative spots, so if there is a problem you’ll know exactly where to go.